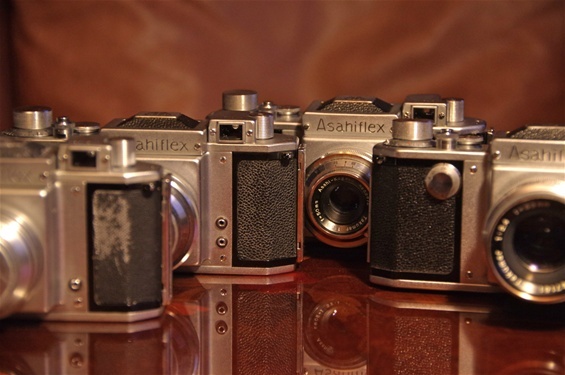 The four different versions of Japans first SLR camera, the Asahiflex. 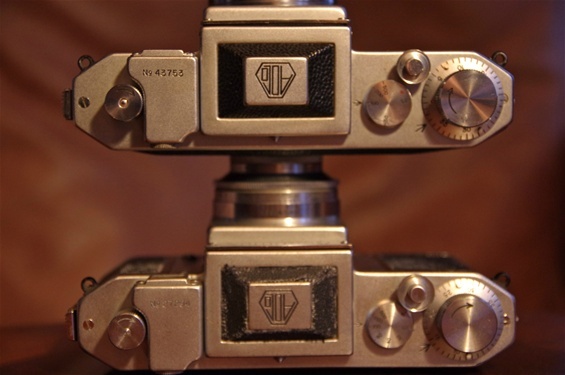 Although no other model name than Asahiflex was written on them, they were called I, Ia, IIb and IIa. The differences between them will be explained below. 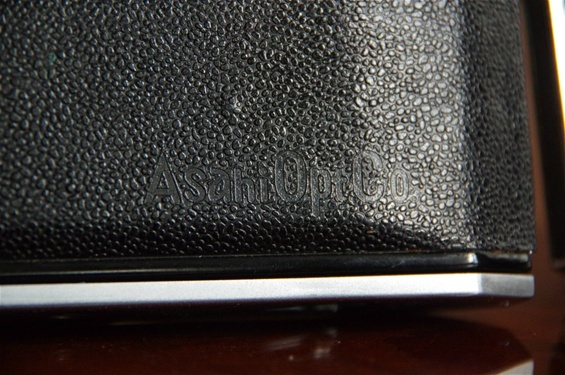 Asahi Optical Co. was founded in 1919, producing optical elements and lenses. 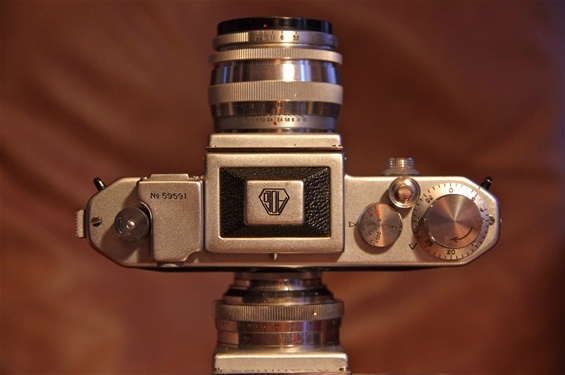 In the late 40s they decided to build up a camera production, and a prototype SLR was ready in 1951. 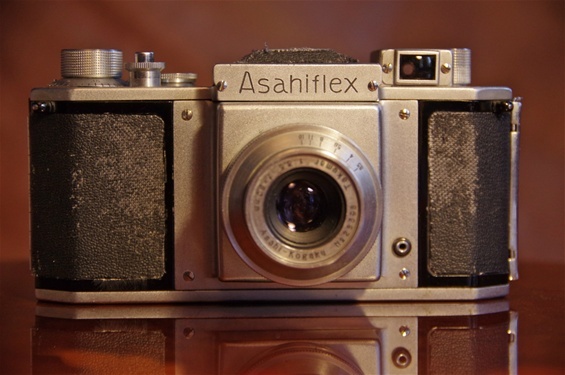 The Asahiflex (Later called 1) entered the marked in 1952 as the first japanese SLR camera. 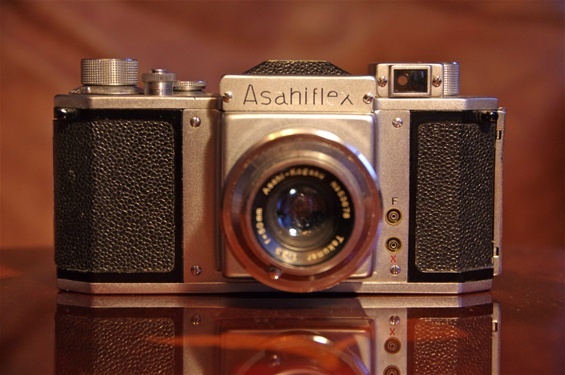 Its later brother, the Asahiflex II b of 1954, is famous for introducing the worlds first commercially successful Instant Return Mirror camera. Asahiflex I was introduced late 1951, and for sale from '52. . Here is a model I, with a single flash contact on the front wall. 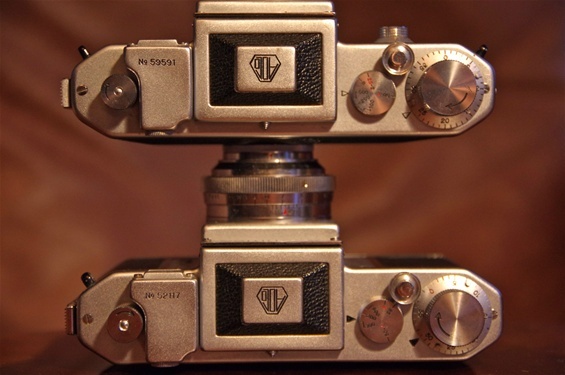 The next model, the Ia, had two contacts, otherwise looking like the first one. (Except for the leatherette being improved.) When receiving the model 1 I was really surprised. I had expected the viewer to be black after exposure, knowing that the first IRM came with the model II b, but that was not so. 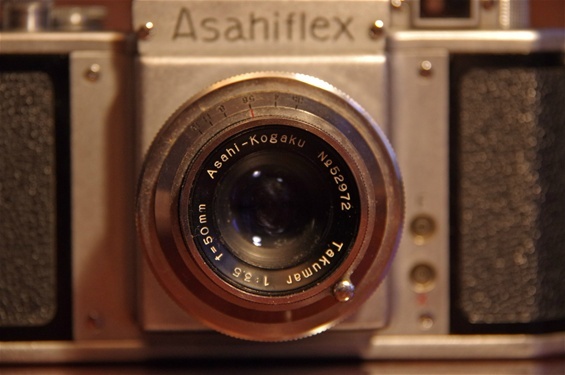 Even the first Asahiflex featured a rapid return mirror, or trigger related mirror, to be more precise. It was the same system that Rectaflex used on all their cameras, or even somewhat improved: when pressing the shutter release button, the subject can be seen clearly through the finder until exposure. 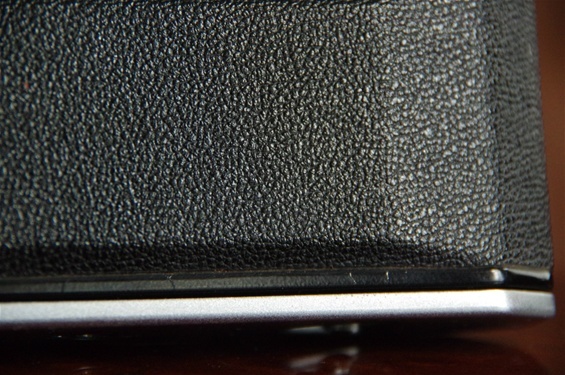 It is not gradually going black, as on other cameras with the same system. After exposure, the mirror follows the movement of the trigger, falling into place as the trigger goes up, as on Rectaflex and others. Size: 147x73(98)x48 mm. Weight: 506 g. Sn:27294. Lens is the Asahi Kogaku Takumar 50/3,5 with sn. 28398. 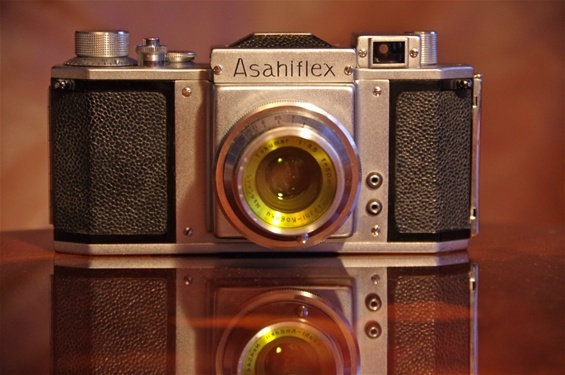 The second Asahiflex, the Ia, was introduced one year after the first, featuring a second flash contact as the most visible change. But there were others. Here a very late sample with sn. 43753. Standard lens is still Asahi Kogaku Takumar 50/3,5, here with a yellow filter. Sn.45445. Differenses from model I (lower) to Ia: Somewhat bolder types on arrows and, more important, shutter times changed from 500-200-100-60-40-30-20 + B on model I, to 500-200-100-50-25 + B on Ia. 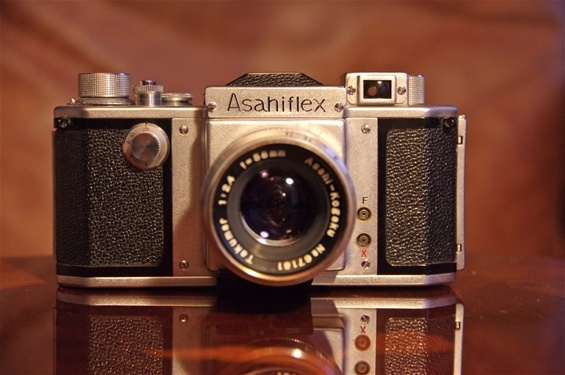 The Asahiflex II b first of all introduced the famous Instant Return Mirror, thus removing the major obstacle for the SLR cameras to fully conquer the market. The one shown here is a very early sample with hardly any visible changes from the Ia, except the letters F and X by the flash contacts. As shown here, the first IIb samples did not show the new design that was going to follow the later ones, but were identical to the Ia from this angle. The standard lens from model I through IIb was the Asahi Kogaku Takumar 50/3,5. Her on the IIb 52117 with sn. 52972. 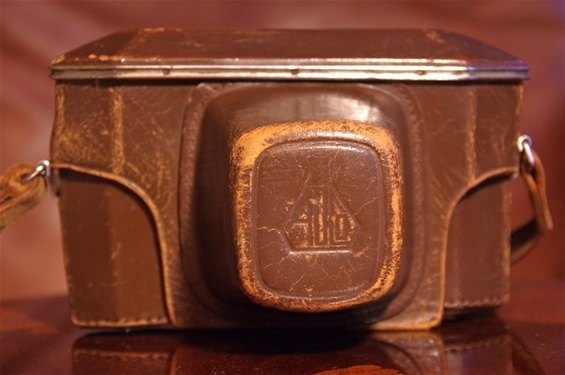 Here is the case for the Asahiflex with Takumar 50/3,5 lens. The last Asahiflex was also the best, introducing the long shutter time dial on right front wall and the high quality lens Takumar 58/2,4. With this model, Asahi was ready for the next step, the Penta Prism SLR! 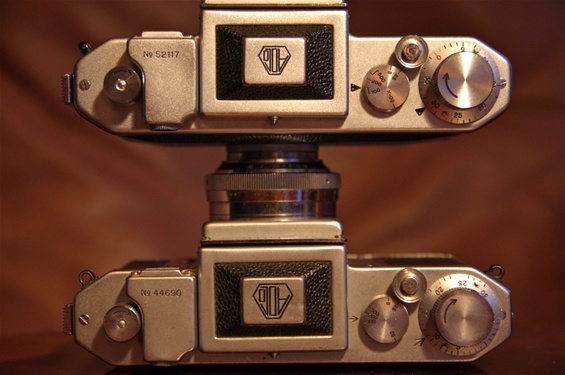 Except for the long shutter time knob on the front wall, the external differences between the IIb and the IIa were minimal: the filled triangles to mark the actual shutter time and frame counter made open. 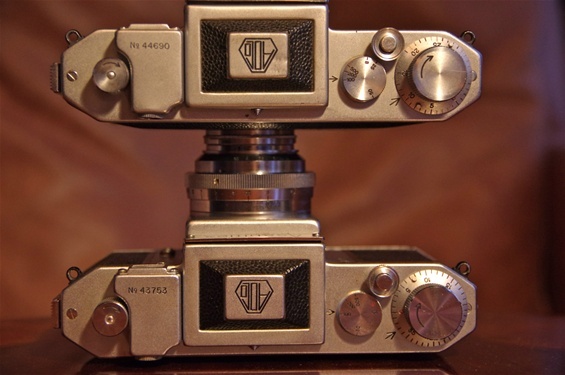 A closer look at the IIa shows most of all the difference between the earlier lens (below) and the new Takumar 58/2,4. The new, bigger lens needed a new case with a wider front. 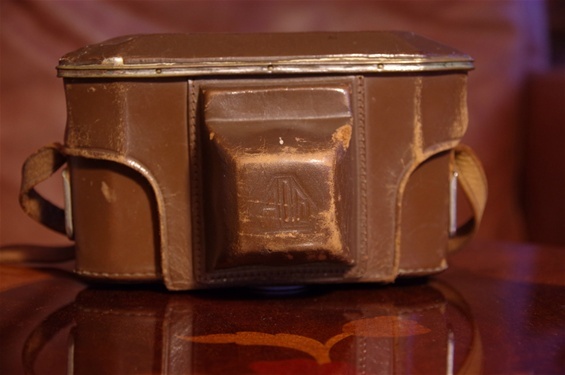 Asahi of 1957: Ready for the Pentax! With the success of and experience from the Asahiflex line from 1951 through 1956, Asahi was prepared for the next step, the penta prism slr. They would soon take a leading role in the development of this new world, inspiring millions of people around the world to seek an easier and better way of photographing! And Pentax would be the new name.